Yesterday, the provincial government released its 2015/16 Second Quarterly Report: an update on where provincial finances are at six months into the fiscal year and where the economy is heading. The news is not very good. BC’s economy is expected to do better than other provinces this year, but that’s largely because of weakness elsewhere (especially in resource-dependent provinces like Alberta). Private sector forecasters have lowered their projections for this year’s economic growth in BC to 2.2% (from 2.7% this time last year). Projections for next year are more optimistic (2.6%) but they should be taken with a grain of salt, given the record of overly optimistic forecasts in the last few years. Weakness in emerging economies has driven down prices for energy, metals and minerals, taking a toll on resource-producing countries like Canada. The Bank of Canada’s commodity price index has plunged since last spring and is now at levels below those seen during the 2008/09 recession (approaching levels of the early 2000s). Energy prices have seen the sharpest decline, with oil tumbling from over $100 a barrel in the first half of 2014 to a low of less than $40 a barrel in August 2015. This has significant ramifications for BC’s plan to launch a liquefied natural gas (LNG) export industry, as current prices for landed LNG in Asia are far below the break-even price for exporters. 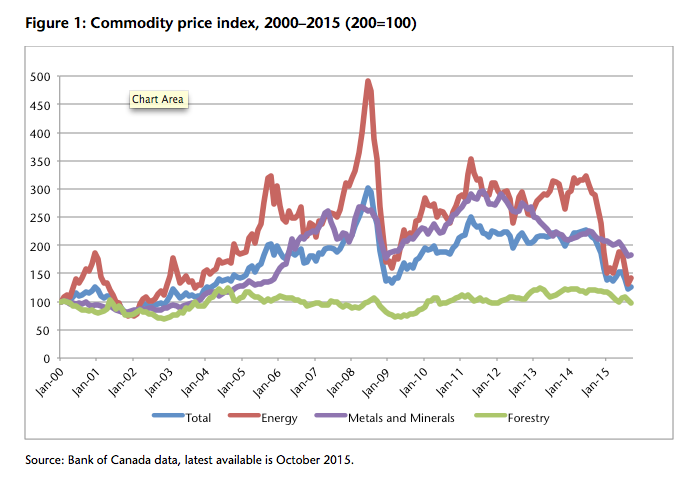 Prices of metals and minerals are also down, as are forestry commodity prices. Global commodity prices are expected to remain low for at least the next year or so. A stronger US economy and low Canadian dollar were expected to boost exports and contribute to growth, but we have yet to see a significant increase in the value of BC exports. While exports have been a positive factor driving GDP growth post-recession, BC Stats data shows very slow—0.6%—growth in BC commodity exports the first nine months of 2015, compared to the same period last year. Statistics Canada’s Annual Capital and Repair Expenditures Survey shows that BC businesses are intending to scale down capital investment (in construction, machinery and equipment) by over 6% in 2015. Weak business investment is central to the problem of poor job growth and a slower economy. In such economic conditions, governments can play a role to stimulate the economy and support demand by running deficits and increasing public investment in infrastructure. Unfortunately, however, at the provincial and federal level, an obsession with balanced budgets has been acting as a drag on growth. Some private sector economists point to the rise of retail spending as a beacon of light amidst negative economic news. Indeed, retail sales have grown by 7% over the first nine months of the year (compared to the same period in 2014)—a faster rate of growth than we saw last year. However, this consumer spending is being financed by increasing debt rather than by growing incomes. BC consumer debt levels per capita continued to increase in 2014 and remain the highest in the country, 18% higher than the Canadian average. Household debt rose faster than disposable income in the second quarter of 2015 (nationally; provincial data is not available). Growing debt levels are thus propping up both consumer spending and real estate markets. After a decade of defying gravity, the possibility of a major correction in overheated real estate markets in BC and Ontario remains a significant risk to the Canadian economy as a whole. The lack of meaningful recovery in the labour market is a significant challenge facing households and, in turn, the domestic economy. Employment growth to date in 2015 has been slow: only 1% since the same period last year. Even more of a concern is the fact that BC’s job growth this year has been concentrated in self-employment: 15,500 self-employment jobs, compared to only 8,000 employee jobs. In fact, the growth in paid employment was less than half a percent, compared to 4% growth in self-employment. Since the recession, self-employment has tended to fall in years of solid growth of paid employment and rise in years of weak growth. In other words, the growth in self-employment in 2015 should be interpreted as a sign of job market weakness, not strength. The one bit of good news is that full-time jobs grew fast this year, replacing part-time jobs in BC. However, this doesn’t erase the years of slow recovery. When it comes to job creation since the recession, BC ranks eighth among provinces, ahead only of Nova Scotia and New Brunswick. A job market with stagnant incomes, in combination with record high household debt levels and potential interest rate hikes in the future, points to weaker consumer spending ahead. 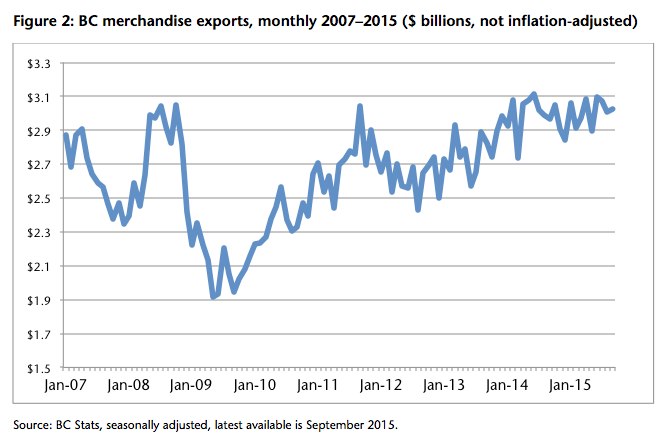 That plus weak business investment and exports adds up to a slow economy. What does this mean for Budget 2016? 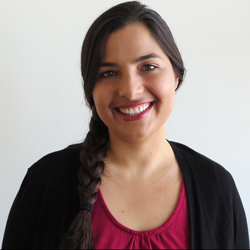 In light of the weak economic outlook, the BC government should prioritize investments in key areas of social and green infrastructure (similar to what the new federal government has proposed). However, Budget 2015 has the province set on a different course. Budgeted increases for key public services (with the notable exception of health care) are significantly lower than the growth in projected government revenues, and in many cases represent actual cuts, once inflation and population growth are considered. Even the health care budget is projected to grow by less than the rate of economic growth. BC ended last fiscal year with a “surprise” surplus of $1.7 billion, and surpluses are projected annually over the next three years. We have a manageable debt-to-GDP ratio of 17.2%, one of the lowest in the country. It’s clear that the province is heading into 2016 in a strong fiscal position to boost the economy and help some of BC’s most vulnerable residents. 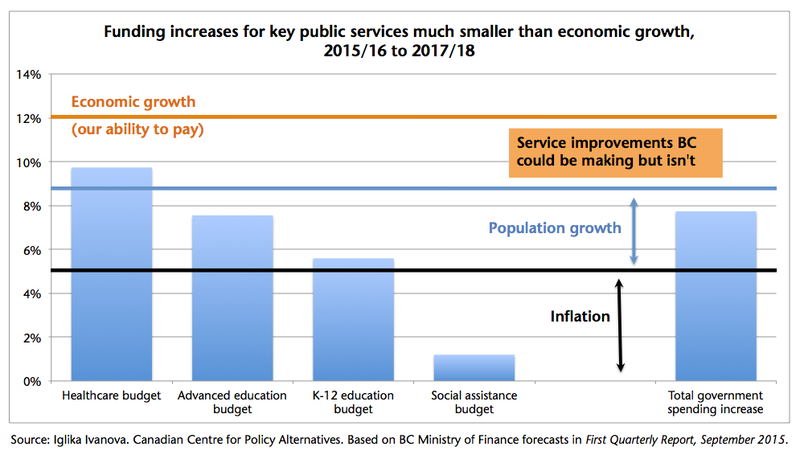 For more concrete policy recommendations on how Budget 2016 can do that, see CCPA’s Submission to BC Budget Consultation 2016.